What’s the best video camera for younger filmmakers? If you want a ‘real’ video camera, a basic HD camcorder is a good choice for children under 12. It’ll be easier to film with than a phone, and they can learn about different lens settings. But they’ll need to copy the files to a computer for editing. Teenagers could use a higher quality camcorder: these are better in low light, and offer more creative options. For young people who are serious about creative filmmaking, a mirrorless camera or DSLR may be the best choice. But for filming news and events, a used semi-professional camcorder could be better. Alternatively, you could use a mobile device like an iPhone, iPad or iPod touch. They have better cameras than basic camcorders, and you can shoot and edit on the same device. If you already have an iPhone, you may be better off kitting it out for filmmaking rather than buying a separate video camera. An electronic gimbal stabiliser (from around $140/£130) will let you get smooth, flowing camera movements. But the DJI Osmo Pocket stabilised camera ($349/£329) is more convenient. HD camcorders are an easy way to shoot high-quality video. They’re easy to handhold and most of them feature better image stabilisation than phones and tablets. 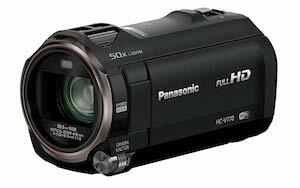 Panasonic and Canon camcorders come top in reliability surveys. You don’t need 4K Ultra HD, which many computers will struggle to edit. 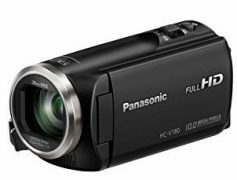 The Panasonic HC-V180K costs around $180 (£170). It’s small, easy-to-use, and has a good wide angle lens and optical image stabilisation. It can also shoot time-lapse and slow motion (more details on this page). The Canon HF-R800 (not available in Europe) is hard to beat at around $200. It has slow motion, time lapse and a microphone socket. The lens doesn’t go very wide, but a filter ring lets you add a wide-angle adapter. More details on this page. The Panasonic V770 offers a great set of features for under $400 (£350). It has a microphone socket, an accessory shoe, a filter ring, 120fps slow motion and excellent image stabilisation. Teens who are seriously into filmmaking might prefer an interchangeable lens mirrorless camera or DSLR. They’re trickier to use than camcorders, but their images look more ‘film-like’, they’re better in low light, and you can get creative shallow focus effects. Panasonic’s G7 costs under $500, but it can shoot 4K Ultra HD video, and 1080p slow motion. It has a microphone jack but no headphone socket. It’s mirrorless, which makes it smaller and more convenient to use than a DSLR. But there’s no image stabilisation, so you will definitely need a tripod. If you’re spending over $600 (£500), you could consider a mid-range DSLR or mirrorless camera. The Panasonic G85 (G80/G81 in Europe) is more solidly built than the G7 and has a better kit lens and image stabilisation. Panasonic UK/Ireland currently have a mail-in £200/€240 winter cashback deal on the G80. 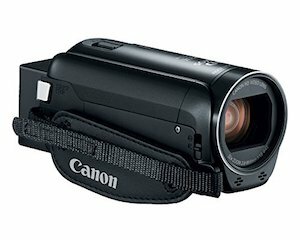 You could also look for a used semi-professional camcorder like the Canon XA10 or XA20. These have better controls, handling and audio than DSLR or mirrorless cameras, which makes them more suitable for news and events. I recommend budgeting for a basic tripod: video looks much better without camera shake. You’ll also need memory cards, and a spare battery can be useful. Apple’s mobile devices are a great option for starting with filmmaking. Children can shoot and edit on the same device, and you can get dozens of apps to extend their capabilities. They don’t have zoom lenses, but their video quality is better than low-priced camcorders. All current Apple devices shoot 1080p Full HD video, timelapse, and slow motion. The iPhone 6S and later phones can shoot ultra high definition 4k. Making Movies Make Sense is my interactive introduction to filmmaking for ages 9 and up. It explains how to use the camera, sound and editing to tell stories, and how to plan, shoot and edit a movie. This 148-page multitouch book includes dozens of video clips, stills, interactive pictures, audio clips and pop-up tips and questions, with practical activities and links to downloads. It’s made for Apple Books, so you can use it on iPad, Mac or iPhone. You can download a free sample.